Why would 60 grown men and women take a full week of their vacation to travel to Indian Creek Youth Camp in the hills and hollows of West Alabama with 190 children? Why would these normally intelligent people leave the comforts of their own beds to sleep on thin mattresses inside a small cabin that doesn’t even have running water? Why would adults, accustomed to the comforts of daily American life give up their nice, master baths to use a concrete block bath house that sometimes has no hot water? In operation since the 1970’s Indian Creek Youth Camp has seen thousands of young people enter its gates and grow in the faith with Jesus Christ. While the camp is plenty of fun it is the emphasis on the Bible that makes ICYC special. During our week of camp the schedule called for about 4 hours of Bible study or worship each day. In addition, some campers participated in the Bible Bowl in which they answered difficult questions from our theme Bible book. This year, our book was Ruth. I suspect our campers know more about Ruth than many adults! 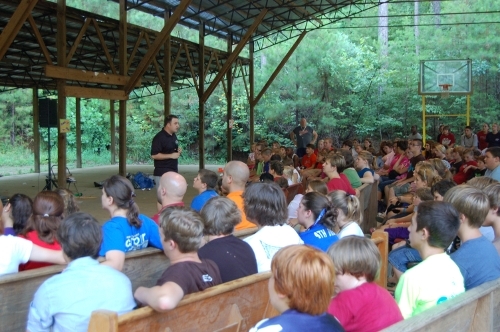 Many young people make critical decisions about their walk with Jesus during camp week. This year 11 young people decided to be baptized into Christ while at camp (Romans 6:3). Upon their confession of faith in Jesus (Romans 10:10) they were baptized (Acts 2:38; Acts 22:16) and the placed by God into the number of his people, the church (Acts 2:47). From Eastern Shore, Holland Chupek, Baylee Jessee, C.J. 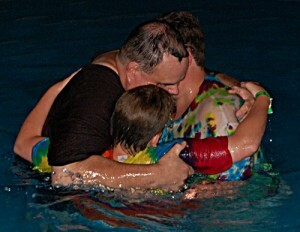 Wolfe and two of my sons, Nathan and Noah Evans were baptized. In addition to these 11 another 31 asked for prayers that they might be better servants of their Lord. Over the years I have noticed that ICYC produces enduring friendships among our young people. They maintain cross-country connections via email and all forms of social media. Beautiful reunions occur every summer as campers make the trek back to camp for another great summer. The camp director is Clark Sims, a young man from Tuscaloosa, Alabama who preaches for the Cottondale Church of Christ. The youth know him as a funny, spirited leader who talks about pink monkeys, gymnatoriums and SCORES! What they may not know is the months of work Clark invests in preparing for camp every year. Clark has already begin making notes about 2011 and giving thought to how the camping experience can be better. He is the magic behind our week at camp. Indian Creek Youth Camp operates 6 weeks of group camping every summer. It also hosts RENEW which is a weekend event in the Spring. Various churches of Christ use the facility for retreats during the remainder of the year. The camp is fully winterized and can be used in all kinds of weather. Air conditioning in the summer makes the Walker County, Alabama temperatures just a little more bearable. Ifv you ask any of the 60 or so adults who were with us if it was worth spending a week in the woods, I really believe everyone would say YES with a loud voice! If any campers or staff would like to comment and add your reflections, please do. We would love to hear from you. I would certainly agree with what you had to say about ICYC. I was never a camper, but started at age 17 as a counselor. It has been a tremendous growth experience for me, that has not stopped. Each year I see some great things take place in our youth, but it also is a great time of spiritual renewal and growth for me and the rest of the staff. We could not make the camp go without godly men and women like you, Clark, and the rest of your great volunteers. Thanks for the sacrifices you make. You and your family have certainly been deeply involved in the camp experience and have made great sacrifices too. It’s amazing how many young people have formed lifelong relationships at ICYC. The impact of this camp is staggering. As for Clark, he has selected the finest group of counselors ever assembled. He’s got that “knack” for making things run so well. Hi Matthias, thanks for dropping by. Baptism is discussed in depth here on the site. Just enter baptism in the search box and it will pull up articles. Of course anyone can and should be baptized upon the confession of Jesus as the Son of God and repentance of sins. Whether a river, a lake, a pool or a baptistery doesn’t matter. So long as the person is immersed in accordance with the Bible teachings. Next post: Have You Been To The Archives?